Porifera, commonly known as sponges, is a phylum in the Kingdom Animalia of the biological classification system known as the Linnaean Taxonomic Hierarchy. Ever since they were created on the fifth day of creation, they have been inhabiting the oceans all across the world. There are approximately 5,000 species of sponges in the phylum Porifera. Under the name of Porifera, there are three lower classes which are Hexactinellida, Demospongiae , and Calcarea. Although these animals are able to eat, they do not have mouths. There is an amazing amount of water that flows through this organism in a 24 hour period of time, which can sometimes reach 20,000 times its volume. No true tissue or loose tissue organization. 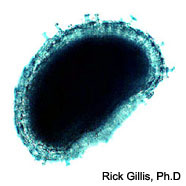 While sponges are composed of a number of specialized cells, the cells are not arranged to form permanent tissues or organs. Filter feeders - Sponges feed by using of unique flagellated cells, called choanocytes, which drive water through systems of canals and chambers, capturing small particles of food in their collars, and ingesting them. The body of a Porifera sponge is permeated by many pores that lead to another set of openings which allow the organism to bring in microscopic organism which it eats. In order to circulate the water that surrounds it, it uses flagella. Flagella, are used to bring the microscopic organisms into contact with sponge by creating a whip like motion. The waste products from the animal are excreted out of the body through the Osculum. As far as reproduction goes when you are talking about the Porifera Sponges, these organisms reproduce asexually in the wild. This type of reproduction is accomplished by budding and fragmentation. These organisms are also able to reproduce sexually in some areas and species. These unique organisms can reproduce rapidly by using a process which is commonly known as regeneration. This process is accomplished when a small piece of the organism breaks off from the already grown and matured sponge, and is able to mature into a complete adult. This process is used widely in the world to rapidly reproduce these organisms for the wild as well as commercial reasons..
Calcareous spicules projecting from the covering of the gemmule provide additional protection. There are a few species of freshwater sponges as well as a couple species of marine sponges that create a asexual bud known as a gemmule. Gemmules are able to withstand many conditions, such as warmth, coldness, dry conditions, and wet conditions. Gemmules are covered with a harder covering than most other organisms of its size and are covered with spicules and small fibers. Later on in the life of the sponge, when the gemmule is no longer needed, it ultimately creates a new organism. When the sponges are in their larval stage, they are able to swim freely until they are able to rest on a solid object that is anchored in the ground. Most sponges are Hermaphroditic which means that they are able to produce both sperm and eggs. Although some sponges have the different sexes the majority of the species are unisex, hence the asexual reproduction. Phylum Porifera and the sponges that fall under that specific phylum, come in very many shapes, sizes, and colors. 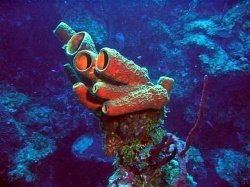 Sponges can be found at all depths of the ocean. There is no limit to the depths it can reach because it is not dependent on the sun. As mentioned above, gemmules are used to protect this particular organism from heat, as well as extreme cold. Porifera sponges are generally sessile which means that they usually stay at a particular spot on the ocean floor where they mount themselves on an object. However, in some cases this is not true because they are able to move slightly during a days time. These animals mostly feed on microscopic animals or some variation of plankton. They use flagella to propel these micro-organisms into their oscules which lead to the stomach of the organism. Sea Sponges are filter feeders which always help the surrounding environment by cleaning up the moss and other unwanted material on the ocean floor. Sponges drying on a wharf. Sponges are used commercially all over the world daily in many different societies and cultures. In ancient Greece sponges were used for the arts such as painting and other sorts of artwork, while in Rome and Egypt sponges were collected and brought in for personal use such as bathing, cleaning or even the earliest form of toilet paper. 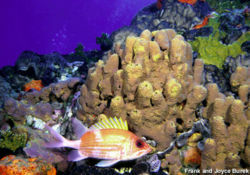 Even to this day sponges are harvested in the Mediterranean Sea as well as the Red sea for commercial use. 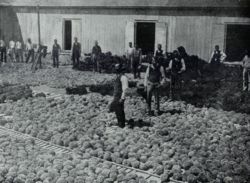 These particular sponges are used strictly for bathing and cleaning purposes. The sponge must go through a rather tedious process before it can be used. The first step in this process is that divers collect the sponges from the various seas in which they grow. They are then transported to factories where they are bleached so that all the various sponges are a uniform color, and then the sponge organism and whatever organisms may be using the sponge for their home are cleared out. Once this stage is completed the sponge is ready to be sold for personal use.